Ag is the chemical symbol for Silver (derived from Greek, árguros; and Latin argentum; both from the Indo European roots of ‘grey’ or ‘shining’). Thirty pieces of silver are featured in this coin album, a soon obsolete book-form with the decline in interest in both collecting and using coins. Coins in usage currently, may soon be replaced by virtual currency, bitcoins etc. in the future. This ‘codex’ like album converts to a leporello form by the retraction of a detachable spine, allowing the transition from a private to public reading. The embossed pages feature coins printed on paper & metallic foil, ranging from old to the new, i.e. shekels paid to Judas Iscariot for the betrayal of Christ, to modern day currency and futuristic coins. 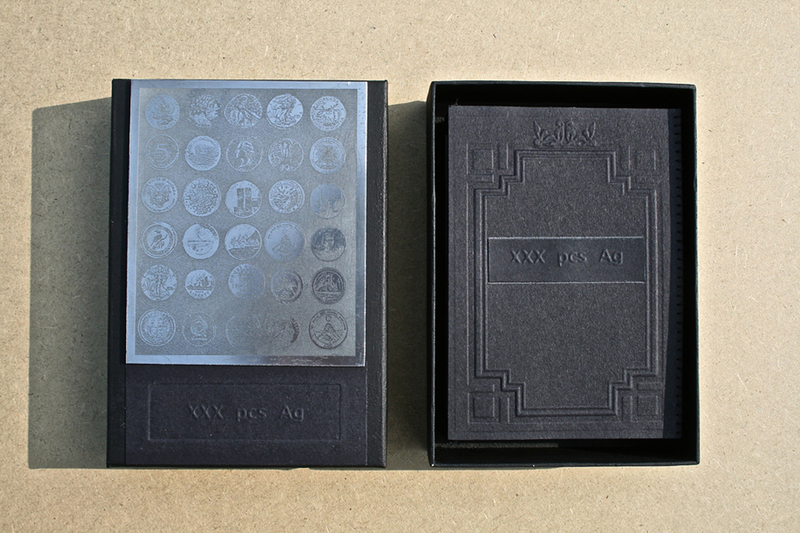 The album is housed within a box, the lid bearing an etched and aquatinted zinc plate.